We are based in Sialkot(Pakistan) and known for providing amazing deals and lucrative offers to the clients. For the safe storage of the entire lot, we have installed our own facility that is laced with all the modern amenities for complete quality satisfaction. 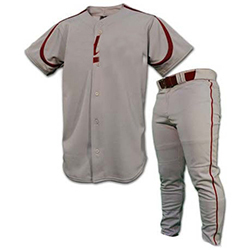 WB-1201 Baseball Uniform has excellent sweat absorbency with a smooth fabric and a distinct design.